The temperature is rising, and sunny days draw us outdoors. 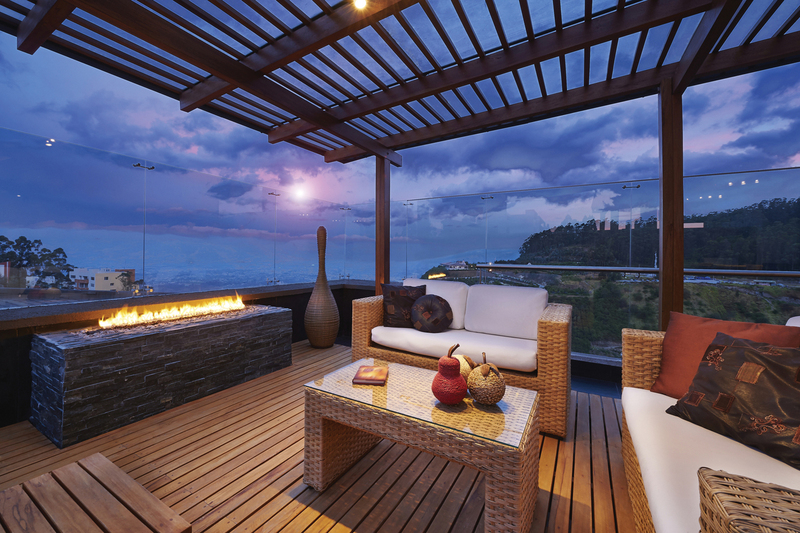 If one has thoughts of enjoying outdoor space by entertaining, eating or just relaxing, then it is a good time to rethink how that area looks and feels. Great outdoor decorating can be achieved on a tight budget by working with existing furniture or planters. Outdoor space does not need to be a large backyard. 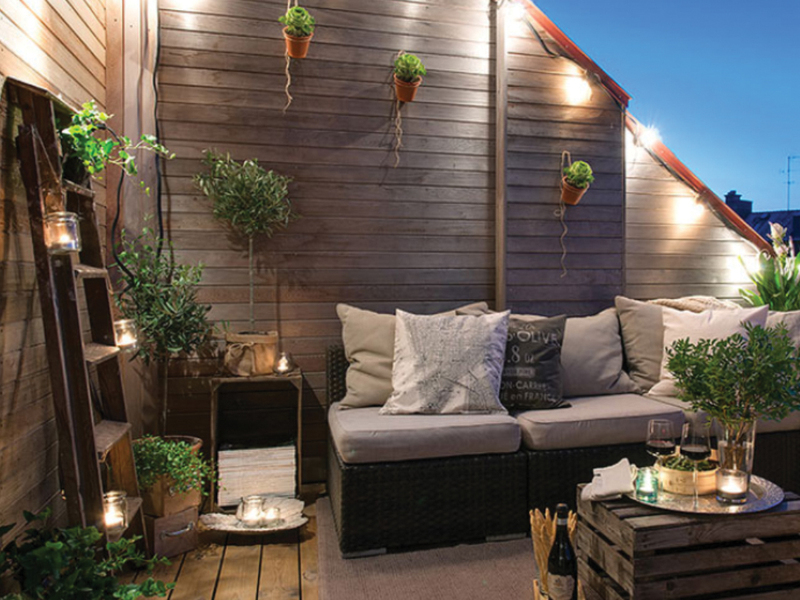 Decorating a small patio, terrace or balcony can be just as rewarding. 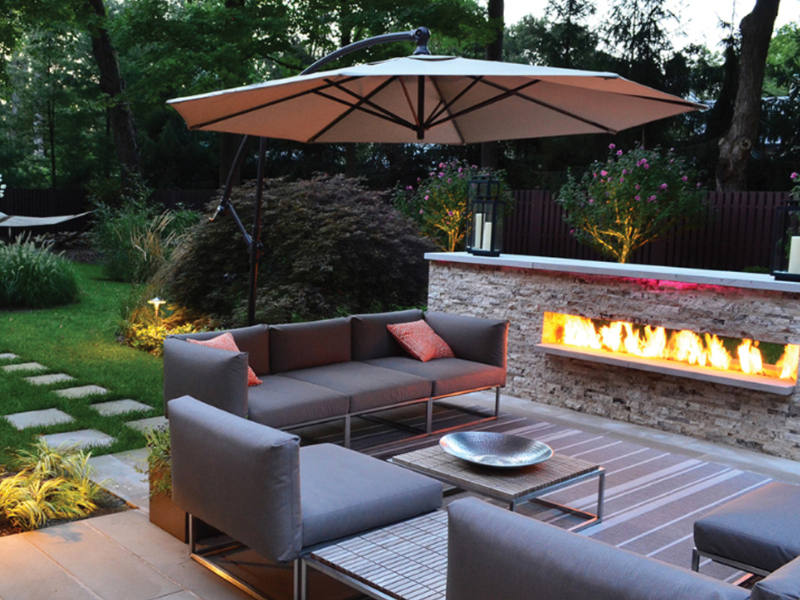 Some outdoor themes and clever ideas help to keep the budget intact and to enable the creation of a beautiful space. Give the space a fresh face by sticking to a simple monochromatic palette. Mixing an oversized white canvas outdoor umbrella and light grey- taupe toned furniture and cushions creates a modern clean crisp patio feeling. Add a touch of color to the outdoor space by purchasing cushions, pillows, pillow covers, and planters in vibrant colors like tangerine, turquoise, fuchsia and bright yellow. Mix stripes, modern patterns, dots, plaids and floral prints to create an interesting display of color and patterns. If the outdoor area is surrounded by fencing, use that as an advantage. Think of the fencing as being walls in a home. Hang open frames painted bright colors, or hang an outdoor canvas like wall art. If the grill is placed near the fence, hang the cooking utensils, and spices from shelves or utensil hanging racks. Maybe add a weather proof clock, and just picture it resembling the indoor kitchen except it is outdoors. Outdoor rugs come in a huge variety of sizes and colors and can be purchased at most home accessory stores or online. Use an outdoor rug under the patio table and then set the table with full tablecloth and plates and napkins. Then add a fresh flower centerpiece, and a unique outdoor experience is created. Outdoor rugs can also define a seating area and create a comfortable conversation area. Adding a variety of occasional tables to accommodate food and drink is helpful to guests also. Extend your outdoor hours by layering in lighting along with a mix of lanterns. Hanging outdoor string lights above a dining or lounging area can create ambiance and be functional also. Lanterns can be purchased from home accessory stores and candles or flameless candles placed inside for glow and extra lighting. Mason Jars with tea lights are inexpensive and an easy effortless addition to any backyard party. If the outdoor space does not have an awning or is not naturally shaded by trees, then create some shade. A white canvas canopy can be attached to fencing, trees, posts or poles inserted into the ground, The shade will be more pleasurable for guests on those hot sunny days. Outdoor umbrellas come in a variety of sizes, shapes and colors and are easily moved to exactly where they are needed to create shade. Create an intimate nook for lounging, reading or just taking an afternoon nap. Find a spot in the trees to suspend a garden hammock and jazz up the area with some hanging lights. Home improvement stores carry outdoor decorative chandeliers, lamps and hanging string lights. So many beautiful varieties of flowering pot plants can be found at nurseries and home improvement stores. Any blooming colorful garden plant added to a colorful pot and placed on the outdoor table or side table of a seating area is the most natural way to add stunning color to your outdoor space. It is the watering and maintenance that causes one to be tempted to buy fake flowers, but nothing beats the real beauty of nature. Thanks for the tip that if an outdoor space does not have an awning or is not naturally shaded by trees, then creating some shade is a good idea. My husband and I are thinking about updating our backyard a little bit to make it more fun, and I think this is a good idea. I also think that adding a canvas canopy to create shade would be useful, and also add to the style of a yard. It would be nice to give the patio a monochromatic look so that it has a nice look to it. I think having some utensil racks near the grill would be a great idea to decorate the grill area. I love your idea to layer lighting along with a mix of lanterns so I might buy some decorative lighting for the patio and install them there.